Muscle Relaxer is an aid in the prevention of muscle tie up in horses. 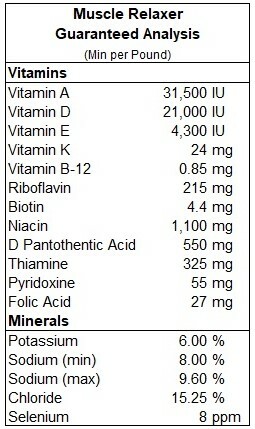 It contains high levels of Vitamin E, Selenium and other vitamins and elecrolytes. Vitamin E and Selenium work to help the muscles relax while the B complex vitamins help to reduce the stress associated with muscle tie-up. The electrolytes help to maintain the proper pH of the gut,to maintain osmotic pressure at the cell level, and to help the muscles relax. So What Is Azoturia or Tying Up Syndrome? Tying Up, Azoturia, Exertional Rhabdomyolysis, and Monday Morning Sickness are all names associated with a disorder that causes a sudden attack of muscle cramping, perspiration, and / or paralysis of horses in the hind quarters. It can also cause the passing of light to dark reddish brown urine. Some of the causes of azoturia can include carbohydrate overloading: which is caused by feeding the full amount of grain when the horse is not working, then returning back to work causing the disorder. Electrolyte imbalance, excessive nervousness, mineral deficiency, vitamin deficiency, over exertion, genetic predisposition, and viral infection all are causes of tie-up. Other than genetic predisposition and viral infection much of the disorder is caused by inadequate nutrition. Some signs could be muscle stiffness and/or shuffling of the hind limbs. In more severe cases the muscle cramps causing pain to set in. In extreme cases the muscles could bulge making the horse refuse to move. Respiration and pulse rates can increase and urine can become dark reddish brown in color as the muscles start to break down. How Can I Manage Azoturia? To manage azoturia you should create preventative strategies for your exercise program and balance your diet. Good nutrition and proper conditioning can prevent many of the problems associated with azoturia. 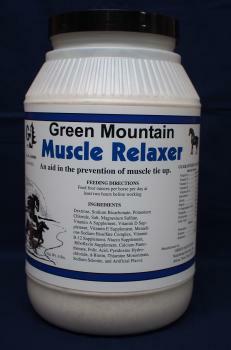 How Can Muscle Relaxer By Green Mountain Nutritional Services Help My Horse? Muscle Relaxer contains all the nutritional supplementation prevent and help horses that tie-up. Muscle Relaxer is loaded with electrolytes including sodium, potassium, and chloride which are three of the most important electrolytes needed to reduce azoturia. Muscle Relaxer also contains vitamins including all the B complex needed for nervous horses. Vitamin E and selenium to help to prevent muscle damage, Thiamine (a B complex-vitamin) is used to help to rid the waste products in the muscle created by activity, and a buffer is included for lactic acid neutralization. How Often Do I Need To Feed My Horse Muscle Relaxer? Muscle Relaxer should be used every day for horses that are chronic cases. What Other Supplements Help With Azoturia? We recommend Total Health to be used with Muscle Relaxer because it supplies all 14 vitamins and 14 minerals needed every day in the proper nutrition in your horse. Body Conditioner a high fat product can reduce the amount of grain to feed that is loaded with carbohydrates and reduce the chances for a more severe case of azoturia. Body Conditioner is made with all vegetable oil products that come from flaxseed, soybeans, and coconut. Note: Horses that are treated with Bute or other medications we recommend Super Horse a complete probiotic and prebiotic supplement to help restore the good bacteria in the intestinal tract. Feeding directions for Muscle Relaxer are to feed four ounces per horse per day. Each package comes with a one ounce scoop. Check your selenium levels and do not exceed 0.3 ppm daily level. Green Mountain Nutritional Services Inc.